The southern Chinese city of Guangzhou thinks it has found the formula to catch up with Beijing and the eastern cities of Shanghai and Suzhou in the development of novel drugs: incentives to win over big international players. Government incentives have attracted investment from such companies as GE Healthcare, a subsidiary of American conglomerate General Electric that focuses on medical imaging and diagnostics equipment and bio-pharmaceutical manufacturing technologies. GE is building its first Asia biotech campus – covering 350,000 square metres and requiring 800 million yuan of investment – in the Sino-Singapore Knowledge City, some 35 kilometres northeast of downtown Guangzhou. The “city” – a joint development project between Guangdong and Singapore in an area one-ninth the land area of Hong Kong – aims to house half a million people and foster high-tech industrial clusters in the high-growth emerging fields of information technology, artificial intelligence, biotechnology, clean energy and advance industrial materials. GE will join the Guangzhou government and biotech industry players to fund the construction of several “KUBio” modular bio-pharmaceutical factories, which the healthcare giant says will shorten the completion time from 30 months to 18 months, cut construction cost by half, and quicken drugs commercialisation. Guanghzhou’s push comes as China has emerged as the world’s second-largest pharmaceutical market, with Beijing, Shanghai and Suzhou key centres of drug development. The country now has 67 biopharmaceutical industrial parks, according to healthcare database compiler hsmap.com, though many are lacking in innovation capabilities. Three of Guangzhou’s biggest competitors are: Beijing’s 2.5-square kilometre Zhongguancun Life Science Park, set up 18 years ago, whose 60-plus tenants include the National institute of Biological Sciences, Tsinghua University-affiliated genomic and diagnostics kits developer Capital Bio, Denmark’s Novo Nordisk and US biotech firm Sanofi Genzyme; Shanghai’s 3-square kilometre Zhangjiang Biomedical Industry Base established in 1996 that houses more than 400 biopharmaceutical firms, and Suzhou Industry Park’s BioBay that opened in 2007 and is home to more than 400 start-ups. To try to persuade international players to set up shop in Guangzhou, the city is offering government investment into enterprises’ projects, as well as cheap land and loans. Under an investment intent agreement signed in December, one KUBio modular factory will be built for Basel, Switzerland-based Lonza, a 121 year-old company and one of the world’s biggest suppliers of custom development and manufacturing services to drug developers. Asked why Lonza, which has production facilities in around 60 cities globally, decided to set up another facility in Guangzhou – whose novel drugs discovery industry is less developed than cities such as Beijing, Shanghai and Suzhou – its incoming chief executive Mark Funk said government support plays a key role. Lonza already has a “small molecule” chemicals drugs factory in Guangzhou built in 2003. Funk said It will enter into a “sale and leaseback” arrangement with GE, under which it will “rent” a “large molecule” biological therapeutics plant to be built by GE to Lonza’s specification for a number of years before taking ownership. Some 160 workers are expected to be recruited to run the plant, which will be its first biological products facility in China and is scheduled to be completed next year. Although biologics only accounted for 8.7 per cent of the global pharmaceutical research and development services market, it is forecast to grow by an average 16.8 per cent in the five years to 2022, much faster than 10.8 per cent of chemical drugs, according to the projections by market research consultancy Frost & Sullivan. Most novel cutting-edge cancer treatments are biologics products. Funk said two reform policies by Beijing to speed up drug innovation were key to Lonza’s decision to boost its investment in China to meet surging demand for its services. First, since 2016, a pilot project in 10 municipalities and provinces has allowed license holders seeking to commercialise their new drugs to use third-party manufacturers, instead of building capabilities in-house, as previously required. This has benefited drug developers, particularly small and mid-size life sciences firms. Second, a law change in July last year has also allowed foreign clinical trial data to be admitted in China for drug approval purposes, which has reduced the need for local clinical trials in China. Beijing-based and Hong Kong and New York-listed cancer treatments developer Beigene is another company taking advantage of the Guangzhou government’s incentives, which include “strong support in funding, management service and a good business environment” according to a government statement. A 2.2 billion yuan plant being built in the “knowledge city” will be funded with 200 million yuan of cash from Beigene, one billion yuan of cash and shareholder loan from the government, and one billion yuan of commercial loans. The first phase construction of Beigene’s Guangzhou plant is expected to be completed in this year’s fourth quarter, a spokesman told the South China Morning Post. The joint venture plant, in which Beigene has controlling stake, will produce biological therapies including Tislelizumab, an immuno-oncology drug under trials to prove its efficacy in manipulating the immune system to attack solid tumours and blood cancer cells. Asked why Beigene decided to bolster facilities in Guangzhou given it also has facilities in Beijing and Suzhou, he said the Beijing premises are used for research and development, while the Suzhou plant focuses on small molecule drugs manufacturing and small-scale production of biologicals for clinical trials. 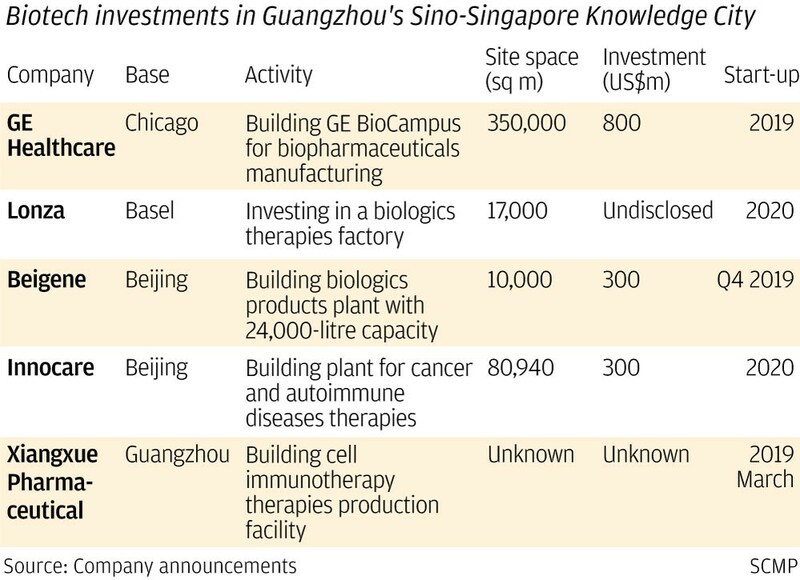 “The Guangzhou facility, on the other hand, is specifically built for large molecule biological drugs and is located in a much larger land lot … the local government has given us very favourable policy support,” he said. Not all companies are as keen as Lonza and Beigene on what Guangzhou offers. Bioduro, a San Diego, US-based supplier of outsourced drugs development services to drug discoverers with facilities in Beijing and Shanghai, is looking for a third site in China and is leaning towards cities not too far from the two Chinese cities for easier management. “We did consider Guangzhou as our new site location,” its China general manager Deng Tianjing told the Post. “The city has attracted many big names to set up [facilities there], and there is no contract research organisation there yet which is attractive to us,” Deng said. “However, compared to north and east China where we have been operating for years, we are less familiar with this region,” Deng added.